Windows 10 Version 1809 (Windows 10 October 2018 Update) brings very few cosmetic changes, but a lot of new features – most of them are very useful. Like Version 1809’s clipboard manager for instance. In previous versions of Windows, the search feature has been lacking – leading the the development of freeware (and trialware) Windows search utilities. Finally, Windows 10 Version 1809, you’ll find an enhanced search feature that will improve Windows searches and help you file things faster. And, it’s easy to set up – all you have to do is turn it on. If you’re using Windows 10 Version 1809 (to see what version of Windows 10 you’re using type WINVER in taskbar search and press Enter). Here’s how to turn on enhanced search. 1,) Open Settings (right-click on the start button and click “Settings” – or press Windows Key + i ). 2.) In Settings click on Cortana. After you do this, Windows will search your entire PC instead of selected folders. Keep in mind after you change this setting it will take Windows a few minutes to re-index your files for faster searching. There are more options such as excluding folders, but we’ll save that for later. 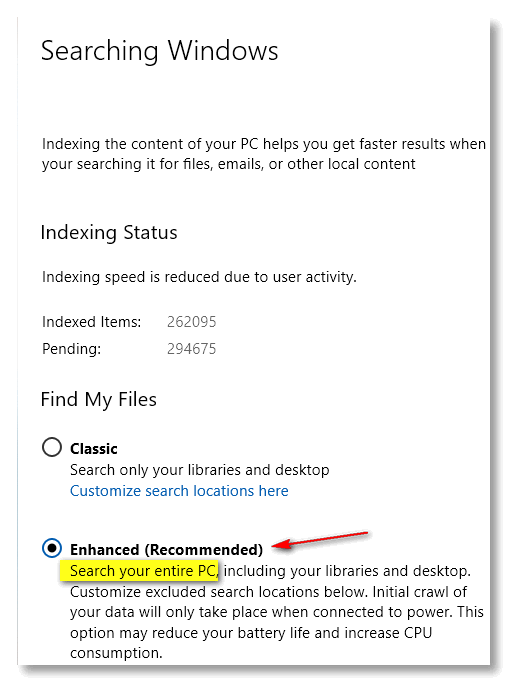 What we all want is faster and better search results when searching our Windows 10 computers… and turning on Enhanced searching is one way you can make that happen. 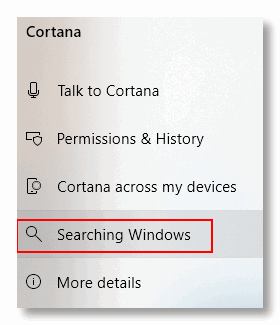 I have windows 1809 as stated in winver, but when I click on Cortana there is no line that says searching Windows. Do I not have the right version?Thanks…. I am running the first released edition of 1809 update build # 17763.134 and having no problems that I know of. That being said, I do not have the Searching Windows option under Settings > Cortana. Can you tell me why I do not? I would like to know if this latest version of Windows 10 is considered free from glitches and bumps. I have not updated since 2017 and suppose I should catch up. If this one is good, do I just update with it and avoid the March update? It will never be free from glitches and bumps. There is no version of Windows that is. It appears to free from MAJOR issues now, but we still advise waiting until you get it via Windows Update. There will never be a Windows version that is completely error free – there never has been. But most of the time the issues are minor and are fixed with cumulative updates. Thank you. I have automatic updates turned off for major things so hopefully will see somewhere that tells me it is ready.